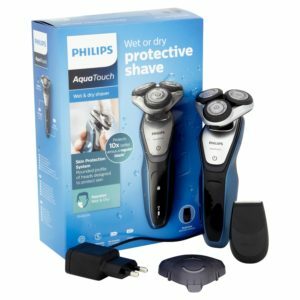 Philips AquaTouch S5420/06 Electric Shaver with SmartClick Precision Trimmer brought to you by Philips, one of the largest men’s personal products companies in the world, has brought another great shaver out with this model. Men who are searching for a protective shave can buy it for daily use, and also men who are looking for one of the best electric shavers for the head. Women who are looking for an ideal gift for their spouses can also choose this one with confidence. Today we will review this men’s electric shaver to help you decide why it is a wise decision to buy. Its rounded heads are designed to protect your skin from possible injuries like nicks and cuts. Which helps to make it one of the best electric shavers for the head. The heads can be flexed in as many as five directions. This allows for five independent movements and helps in a fast and close shave even in the neck and jaw-line. It just requires one hour charge time and there after allows 45 minutes of shaving due to its long lasting lithium-ion battery. The trimmer helps you to trim your mustache and sideburns to give you an entirely new look by popping it on in place of the shaver. It comes with a warranty of two years and the blades can be replaced in case they are damaged or rusted. Includes a 2 pin charger, and protective cap for the electric shaver. It works within an automatic voltage range of 100-240volt. The maximum power consumption is 9W and the stand-by power is around 0.1 W.
It is quite skin-friendly and comfortable when being used. It protects the skin up to ten times better way than a regular blade to reduce micro cuts. It is suitable for both dry and wet shave, i.e. can be used for both in shower using gel or foam and out of shower dry shave. You can ensure a faster shaving experience with the highly efficient blades. The long hairs are raised by the first blade, and the second blade cuts comfortably just below skin level. It is provided with one level battery and travel lock indicators. The LED indicator provides useful indications such as 1 level battery indicator, cleaning indicator, replacement head indicator, travel lock indicator and battery low indicator. It has an ergonomic grip and can be easily handled. It comes with a precision timer and protective cap. The head can be replaced every two years. It is reasonably priced and comes for around £58. No accessories like a cleaning brush or pouch is found in the packaging. It is a bit heavy to handle. Some users have claimed that it does not shave as fast as claimed by the manufacturers. The product is designed to meet various purposes like shaving, trimming and styling for both the face and the head. It is smoother than a razor shave and is suitable for both in-foam and out-foam shaving. A few customers have raised certain issues, but the vast number of positive reviews of the product has been able to nullify them. Overall the Philips AquaTouch S5420/06 Electric Shaver with SmartClick Precision Trimmer is a great men’s electric shaver to buy and current has 4.1 out of 5 stars, with 74% being 4 star or higher.